Search For Malaysian Jet Spots Oil Slicks In Waters Off Vietnam : The Two-Way An international search-and-rescue mission is scouring the waters off Vietnam's coast after a passenger jet carrying 239 people disappeared en route from Kuala Lumpur to Beijing. A woman, believed to be the relative of a passenger onboard Malaysia Airlines flight MH370, cries as she talks on her mobile phone at the Beijing Capital International Airport in Beijing. The flight departed from Kuala Lumpur and was last reported over open waters between Malaysia and Vietnam. Citing the head of Vietnam's Civil Aviation Administration, The New York Times says the discovery could be the first hint of the plane's location. According to the newspaper, the official, Lai Xuan Thanh, said one oil slick is 12 miles long. The military planes are part of an intense international search for a Malaysia Airlines flight that had 227 passengers and 12 crew members aboard when it went missing after taking off from Kuala Lumpur early Saturday on a flight bound for Beijing. Into Saturday night in Asia, the search focused on waters between Malaysia and Vietnam, where contact was last made with the jet, a Boeing 777. The search effort will include the U.S. Navy, which is sending a ship and a plane to help. The U.S. State Department has confirmed that at least three U.S. citizens were on board the flight. After the passenger manifest was released Saturday, reports emerged from Italy and Austria that two names on the list belong to people whose passports had been stolen in recent years. Flight MH370 left Malaysia shortly after midnight, local time. That's late morning Friday on the East Coast of the U.S. It should have landed in Beijing around 6:30 a.m. there — 5:30 p.m. ET Friday. Instead, the airline says, contact was lost about two hours into the flight. Other data, from the online tracking site Flight Radar 24, indicates the plane may have gone missing somewhat earlier. "Malaysia Airlines is currently working with the authorities who have activated their Search and Rescue team to locate the aircraft," the airline said in a statement posted to its Facebook page. As happens when news is breaking, some information that's being reported may later turn out to have been incorrect. We'll focus on reports from officials involved in the search and news outlets that have reporters in important locations. As events have continued to develop overnight in Asia, we've published a new post summarizing the story as it stands. That's where we'll be posting new updates as news emerges. It seems that two people on the Malaysian jet might have been traveling with stolen passports, in an unusual development that emerged after the flight's passenger manifest was released Saturday. Italian newspaper La Repubblica reports that Luigi Maraldi, 37, whose name is on the manifest, is alive and well in Thailand. That's where his passport was stolen last August, the newspaper says, citing the foreign ministry and the man's parents. According to La Repubblica, officials visited Maraldi's parents' house to inform them of their son's apparent death. But the parents said they'd just spoken to him on the phone — that he had called from Thailand to assure them that he was OK.
Austria's foreign ministry tells CNN that one of its citizens whose name is listed on the manifest reported his passport stolen two years ago, as we reported earlier. The U.S. Navy says that the "USS Pinckney (DDG 91), an Arleigh Burke-class guided-missile destroyer, is en route to the southern coast of Vietnam to aid in the search efforts of the missing Malaysia Airlines flight MH370." The Pinckney had been in international waters of the South China Sea when the alert went out about the jetliner. "The ship could be in vicinity of the missing jet within 24 hours and carries two MH-60R helicopters equipped for search and rescue," the Navy says. The service is also dispatching a-3C Orion aircraft from a base in Okinawa, Japan, to bring "long-range search, radar and communications capabilities to the efforts." Malaysian Prime Minister Najib Razak warns against leaping to conclusions based on reports from Vietnam of oil slicks that were found in the search area for the downed jetliner. "It is too early to come to any conclusion because we are looking at all possibilities," he said, according to the New Straits Times. "Some theories have been put forward but they will remain just that until we have concrete evidence." Noting that no wreckage has been found, the leader said, "It is too early to make any conclusive remarks." The prime minister added that the search area was being widened. "Austria denies that one of the citizens included on the passenger list issued by Malaysia Airlines was on board, Austrian Foreign Ministry spokesman Martin Weiss told CNN Saturday. The Austrian citizen is safe and sound and his passport was stolen two years ago, Weiss said. "There also was no Italian citizen on board the flight, despite the presence of an Italian name on the passenger list released by the airline, Italian Foreign Ministry spokesman Aldo Amati said Saturday." Malaysia Airlines Flight MH370's passengers include three U.S. citizens, a senior State Department official has confirmed. 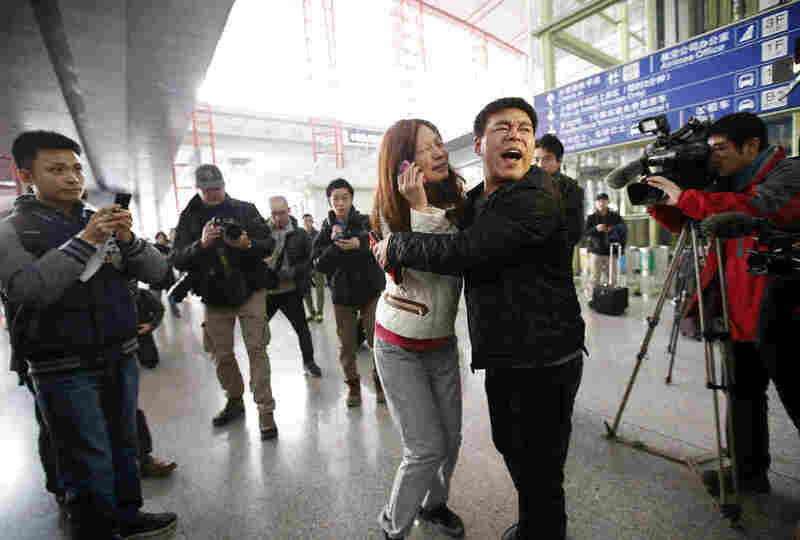 American embassies in Kuala Lumpur and Beijing are in contact with those citizens' families, the official said, adding that the State Department is also looking into whether any other U.S. citizens might have been on the flight. Vietnamese military planes have spotted two oil slicks off the country's coast that could be a sign of the missing Malaysia Airlines passenger jet, according to several media outlets. Officials say ships are being sent to the location of the sighting. "'We have sent vessels to the site of the suspected oil spills and they are expected to reach the site tonight. It's very likely that this is the sign of the missing plane,' said Lt. Gen. Vo Van Tuan, deputy chief of staff of Vietnam People's Army, speaking live on Vietnam national television." "An international search and rescue mission was mobilized this morning," Malaysia Airlines says in a statement it just posted. "At this stage, our search and rescue teams from Malaysia, Singapore and Vietnam have failed to find evidence of any wreckage." With night falling in the area, where it's now 8 p.m. Saturday, search aircraft are apparently heading back to their bases. The airline says that "the sea mission will continue while the air mission will recommence at daylight." While the airline's latest statement repeats earlier information indicating the jet disappeared from air traffic controllers' radar screens about two hours into its flight, the online tracking site Flight Radar 24 reports that "Flight #MH370 took off from Kuala Lumpur at 16:41 UTC time and disappeared from www.flightradar24.com at 17:20 UTC time." That would be about 40 minutes into its flight. "A Malaysia Airlines spokesman said on Saturday evening that the last conversation between the flight crew and air traffic control in Malaysia had been around 1:30 a.m., but he reiterated that the plane had not disappeared from air traffic control systems in Subang [Malaysia] until 2:40 a.m."
"The Boeing 777 flown by Malaysia Airlines that disappeared Saturday morning over the South China Sea is one of the world's most popular — and safest — jets," The Associated Press points out. "The long-range jumbo jet has helped connect cities at the far ends of the globe, with flights as long as 16 hours. But more impressive is its safety record: The first fatal crash in its 19-year history only came last July when an Asiana Airlines jet landed short of the runway in San Francisco. Three of the 307 people aboard died." Much of the focus of investigators looking into that crash in San Francisco has been on the pilots' actions and signs that they approached the airport too low and too slowly. "We understand everyone's concern on MH370 pax & crew," Malaysia Airlines just stated on its Twitter page. "We're accelerating every effort with all relevant authorities to locate the aircraft." The Wall Street Journal writes that "search and rescue crews from across Asia are scrambling to discover the fate" of the missing jet. "Authorities from Malaysia and Vietnam dispatched aircraft to scour the waters between the two countries for signs of flight MH370. The Philippines also said it would mobilize vessels to look for wreckage and survivors." In its latest statement, Malaysia Airlines says that "so far, we have not received any emergency signals or distress messages from MH370." Reuters notes that the lack of any emergency signal is "a chilling echo of an Air France flight that crashed into the South Atlantic on June 1, 2009, killing all 228 people on board. It vanished for hours without issuing a distress call." In the past hour, the airline posted updated information on the nationalities of the 227 passengers. One change: Earlier, there were reports about four U.S. citizens, including an infant, on board. Now, the airline says the passenger manifest shows three U.S. citizens, including an infant. The 12 crew members are all Malaysian citizens, the airline says. The search for the lost plane has now been underway for more than 12 hours in the waters between Vietnam and Malaysia. The Philippine military has dispatched three ships and a surveillance plane to join the search effort. Boeing issued a statement saying the company is assembling a technical team to assist investigators. "Boeing offers its deepest concern to the families of those aboard missing Malaysia Airlines flight MH370," the statement said. Malaysia's acting transport minister asked the public to refrain from speculation until evidence of the plane is found, the BBC reports. "We are doing everything in our power to locate the plane. We are doing everything we can to ensure every possible angle has been addressed," Seri Hishammuddin told reporters in Kuala Lumpur. Grieving relatives are being cared for in a room in the Kuala Lumpur airport, where media have been barred from entering, BBC reporter Jennifer Pak tweeted earlier this morning. In Beijing, friends and relatives were instructed to go to a nearby hotel. As the search continues, China's Xinhua news agency says the airplane lost contact in Vietnam's air space. An airline executive told CNN that the airliner's last communication was over the South China Sea, between Malaysia and Vietnam. China's CCTV tweeted that China has sent two ships to the South China Sea for rescue operations. Update at 10:36 p.m. ET. 4 Americans? Yahya said the man piloting the plane was Capt. Zaharie Ahmad Shah, a 53-year-old Malaysian, who joined the airline in 1981. Yahya said that that they were working to verify the authenticity of a report that claimed the aircraft had landed at Nanming in China. "Our focus now is to work with the emergency responders and authorities and mobilize its full support," he said. Yahya also clarified that the passengers on the plane are from 14 different countries — 153 of them are Chinese nationals. "According to The Aviation Herald's radar data the aircraft was last regularly seen at 17:22Z (01:22L) about half way between Kuala Lumpur and Ho Chi Minh City (Vietnam) at FL350 over the Gulf of Thailand about 260nm northnortheast of Kuala Lumpur 40 minutes into the flight, followed by anomalies in the radar data of the aircraft over the next minute (the anomalies may be related to the aircraft but could also be caused by the aircraft leaving the range of the receiver). "Aviation sources in China report that radar data suggest a steep and sudden descent of the aircraft, during which the track of the aircraft changed from 024 degrees to 333 degrees. The aircraft was estimated to contact Ho Chi Minh Control Center (Vietnam) at 01:20L, but contact was never established." This matches with the reporting of the Chinese news agency Xinhua, which says contact and radar signal was lost near the Ho Chi Minh zone. Chinese Foreign Minister Wang Yi opened a previously scheduled press conference by saying the news coming out of Kuala Lumpur is "very disturbing." Wang said that "the related departments have activated emergency response mechanism." In a new statement, Malaysia Airlines CEO Ahmad Jauhari Yahya said the airline is notifying the families of those on board the plane. The passengers on the plane are from 14 different nationalities. "Our thoughts and prayers are with all affected passengers and crew and their family members," Yahya said. Boeing, meanwhile, tweeted that that the company is monitoring reports. "Our thoughts are with everyone on board," Boeing said.